This topic contains 2 replies, has 2 voices, and was last updated by Whirlwind 2 months, 1 week ago. 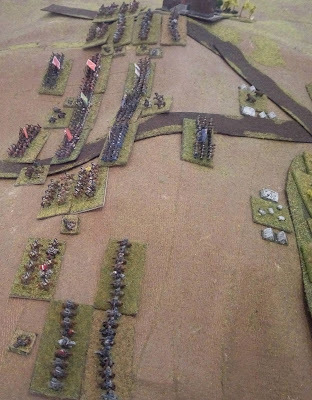 Please see here for an AAR of the Battle of Fleurus, with some first thoughts about the new “Twilight of Divine Right” rules. Very good, I am getting the impression that the rules are naturally giving the ‘right feel’ so that the narrative is natural, rather than the story teller having to be creative with the account. That, together with being able to scale down to the smaller table bodes well for the utility of these rules. I am very positive about them so far. I would be very interested in hearing what a veteran DBR player makes of them, since my experience with other rules for this period is limited to Neil Thomas and Polemos: ECW as far as I can think.